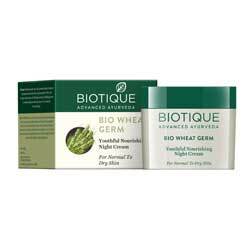 Bio Wheat Germ - Wheatgerm Cream - Firming Face & Body Cream - Natural Anti Oxidant. Biotique - Bio Wheatgerm Firming Face & Body Nourishing Cream. Wheat Germ Oil is one of the most sensitive oils in the botanical world, a natural antioxidant with more Vitamin E than any other natural oil. This rich-feeling, firming cream is blended with pure wheat germ, sunflower and almond oils, vitamins A,B,C,D.E and extracts of carrot and galangal to moisturize and strengthen skin for a more vital, resilient, younger appearance. Right for baby - Right for you. A rich blend of natural oils and plants extract that nourish baby's delicate skin. Helps soothe and prevent nappy redness and chapping. Gently smooth over cleansed face and body with upward strokes, morning and evenings. Ankurit gehun (Triticum sativum) 5.0%, Gajar (Daucus carota) 1.0%, Badam tail (Prunus amygdalus oil) 1.0%, Kulanjan (Alpinia galangal) 3.0%, Surajmukhi tail (Helianthus annus Oil) 2.5%, Cream Base q.s.